Theodora alias Dora Turksma was born on 30 June 1933 in Antwerp. Her parents, boxer Levy Turksma (born on 25 August 1906 in Nijmegen, the Netherlands) and Klara Schilt (born on 15 April 1913 in Berchem, Belgium), divorced when Dora was only two and a half years old. Levy returned to the Netherlands, remarried before the war and had two children. His second wife and both children were deported and murdered during the Holocaust. After the war Levy Turksma married for a third time and had two more children: Dora’s half-brother and half-sister. Before the Second World War, Dora was raised by her single mother Klara Schilt who earned a living as a seamstress making corsets. Mother and daughter lived in Morpheusstraat 15, Antwerp. Dora’s maternal grandparents Lucas Schilt and Rebecca Sousa as well as her aunt Sophia Schilt all lived in the same house. Dora played a lot with the children in her neighbourhood, and started attending the municipal girls school in Lamorinièrestraat in September 1939. On 10 May 1940, Nazi-Germany invaded Belgium. Klara Schilt obeyed all anti-Jewish decrees and registered herself and her daughter in the municipal Jewish register of Belgium. At the end of June 1941, the complete Schilt family moved to Van Leriusstraat 30 into the apartment of Dora’s uncle, a diamond trader, who had been able to flee to the United States. In June 1942 Klara sewed a yellow star onto Dora’s clothes. In the Summer of 1942, life in Antwerp became more and more dangerous for the Jewish community. Dora only just escaped arrest during a raid in Terliststraat and the son of their landlord denounced Jewish families in the neighbourhood. Klara therefore sent Dora away to go and live with the maid who did their housekeeping. Klara herself obtained a false ID and became Mrs. Janssens, moving around from place to place. Dora enjoyed a few months on the countryside living with the maid, playing with local children. Late in 1942, her mother tried to flee with her to Pas-de-Calais, France, but was eventually forced to return to Antwerp. Klara then placed Dora for a few nights at the home of a Mr. Janssens in Mechelsesteenweg, Antwerp, before she took her daughter to a convent in Kontich. However, when it became too dangerous to stay there due to the pro-German sympathies of certain nuns. The priest placed Dora at a children’s colony where she lived the life of a catholic school girl. Klara, not knowing where her daughter was, learned about Dora’s whereabouts when the niece of her maid recognized the child during a group outing. Klara picked Dora up from the colony and sent her to a catholic school in Bruges where she was baptised. In the Summer of 1944, Klara and Dora were reunited and they hid together in Heide at the house of Gustaaf Huvain. Upon Liberation, Klara returned to Antwerp. Dora was subsequently sent to several boarding schools and, after her mother remarried a non-Jewish man from Amsterdam, spent the weekends with her grandparents Lucas and Rebecca Schilt. The elderly couple had survived the war hidden by a woman named “aunt Justine”. Dora’s aunt Sophia also survived the war. However, two siblings of Dora’s grandfather Lucas – Willem and Henriette Schilt – were deported from the Dossin barracks and murdered in Auschwitz-Birkenau. After the war, Dora married, and had children and grandchildren. 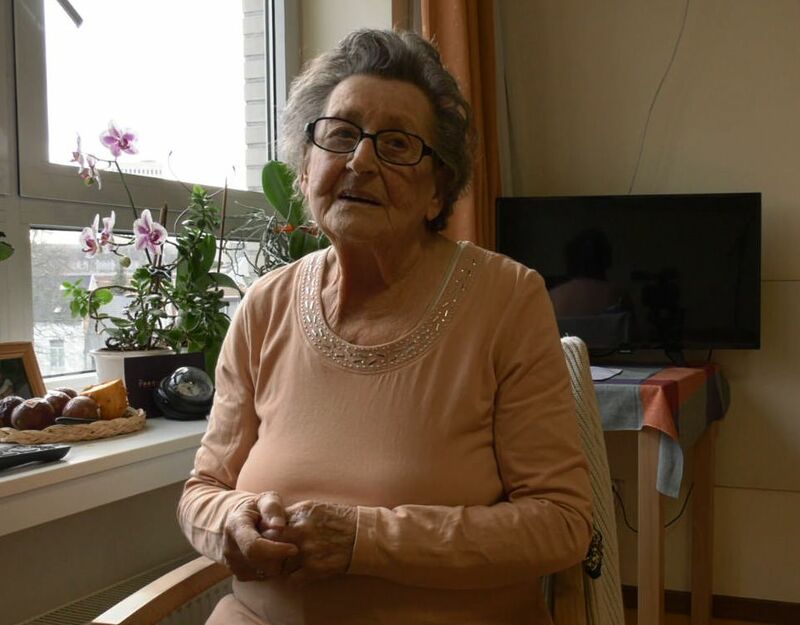 Dora Turksma passed away in early 2019, a few weeks after having been interviewed by Kazerne Dossin. On 19 December 2018 Paul Bucholz permitted the staff of Kazerne Dossin to interview her.